Each piece of Charlotte James furniture is made using the finest kiln-dried hard wood, with frames glued and screwed. Fabric is then inspected and cut by hand to ensure pattern matching and quality control, prior to each piece of furniture being upholstered by our skilled craftsmen. As experts in the industry, we are dedicated to finishing our products to the highest possible standard. 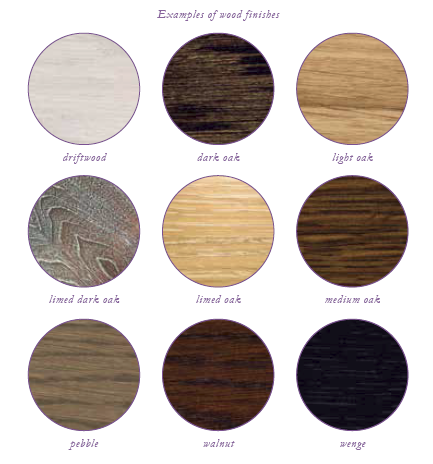 We understand that taste and preferences vary from project to project, which is why we offer an impressive selection of finishing options..
We have a standard range of wood colours. Alternative finishes are available, including individual colour matching or a painted finish on request. Due to the natural variances in the underlying colour tones of different timbers, the effect of grain pattern and the way timber is cut means that an exact match is not guaranteed. Due to the man-made nature of our items, all sizes should be taken as a guide, a manufacturing tolerance may apply. Several pieces of furniture in our range have studding detail and we have an assortment of sizes and finishes to enhance your piece, in addition to those detailed. Alternatively, we can add studs to furniture that doesn’t already have it, or replace it with piping where possible. We have specified our recommended cushion fillings for each product listed in our range. We do, however, understand that cushion fillings are dependent on individual comfort preferences. Please contact us if you wish to discuss your requirements. 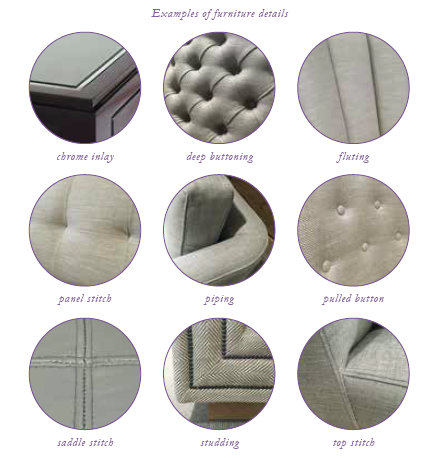 All cushions need regular maintenance to retain their shape and comfort levels. This can be achieved by regular plumping and turning. We believe the Charlotte James Furniture range is comprehensive but also understand that personal preferences vary. Should you wish to adjust a design to suit practical or aesthetic requirements, we will do our best to accommodate. Specified items in our brochure are fitted with castors as standard, available as a square tapered leg with castor, and turned leg with castor. Finishes include polished brass and polished chrome. Other finishes are available on request. Satin-Black Steel is a sleek and versatile finish which complements any colour scheme. Antique brass has a warm and sophisticated tone which contrasts well with all our timber finishes. 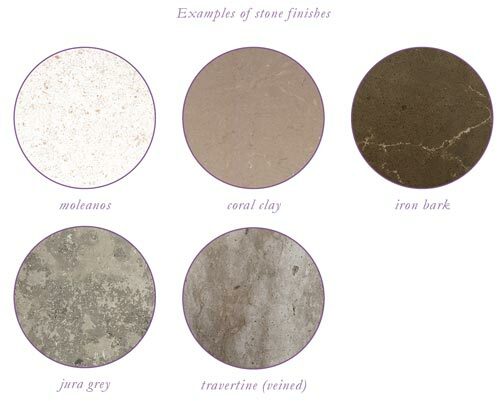 We have a range of five standard stone finishes varying in grain and colour. Alternative finishes are available on request.